Ryobi P721 Hybrid 20 Watt LED Work Light is Fantastic!! I finally gave up trying to keep my old Ryobi 18 volt flashlights working or converting them to LED. 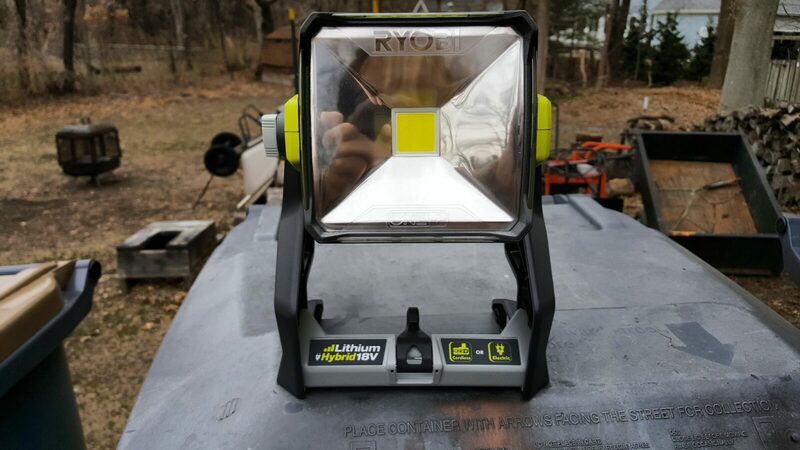 Ryobi sells a 20 watt LED worklight, model # P721 that is really slick and uses their 18 volt batteries. I bought one at my local Home Depot and used it all summer while working on cars, plumbing and electrical work. I must say that I am impressed. The light has two settings, low and high. When I was working in a room or under a car, the high setting was great. Inside a bathroom vanity it was way too bright and the low setting worked much better. They say the high setting is 2,400 lumen — let me tell you, it’s bright. 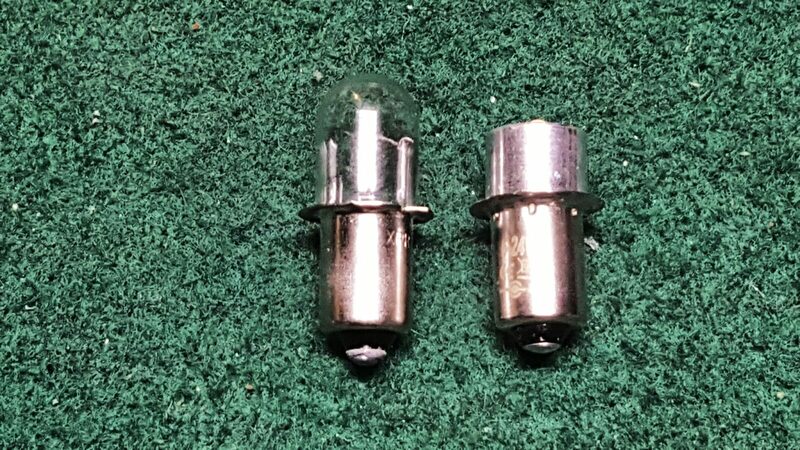 The problem I used to run into with incandescent bulbs is that the filament would burn out and I would need to install a new bulb. LED lights do not have that problem. Ryobi estimates the bulb will last 50,000 hours. To put that in perspective, if you ran the light for one year, it would run for 8,760 hours non-stop. Of course you would drain the battery over and over but the point is that it will be a long time before the LED gives out. The legs are an interesting design and can hang on a two by lumber such as framing or a floor joist. They claim 34 hours on one of the big Lithium Ion batteries and I suspect that is the low setting. When I was doing plumbing and electrical work at my mother-in-law’s house, I killed a big battery in less time than that on full power. All in all, it is a great light. 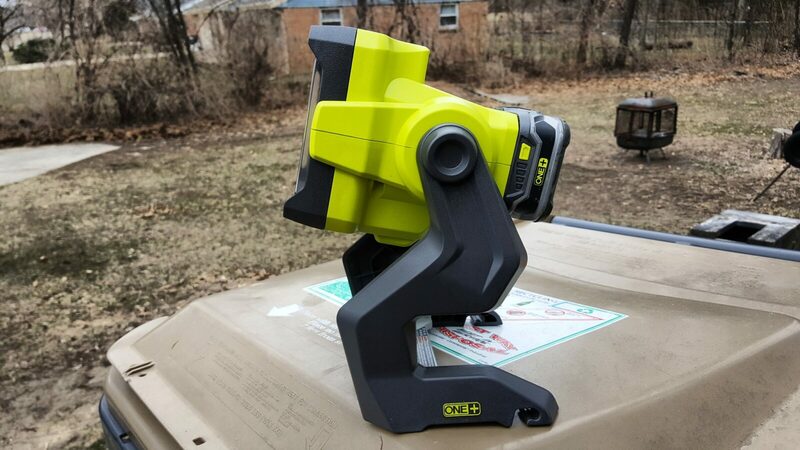 Since I have Ryobi tools and batteries, this purchase was a no-brainer and I plan to buy a second one for ever better coverage while working and the occasional power outage. Ryobi One+ P721 18V 20-W LED Work Light Dual Power Hybrid 20WATT NISB(NOT P720)! 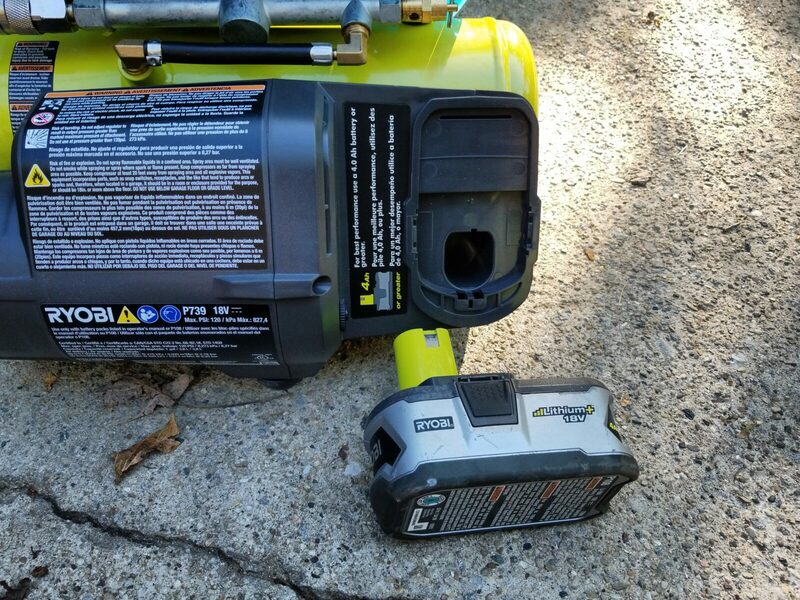 Ryobi P739 18 Volt Compressor Actually Works Good!! The one thing I notice about getting older is that I don’t have the strength to go lugging around as much as I used to not to mention I don’t have a ton of patience either. This issue affects me when it comes to portable compressors. Because of Ronin’s Grips, I have a big stationary 60 gallon Ingersoll Rand compressor. 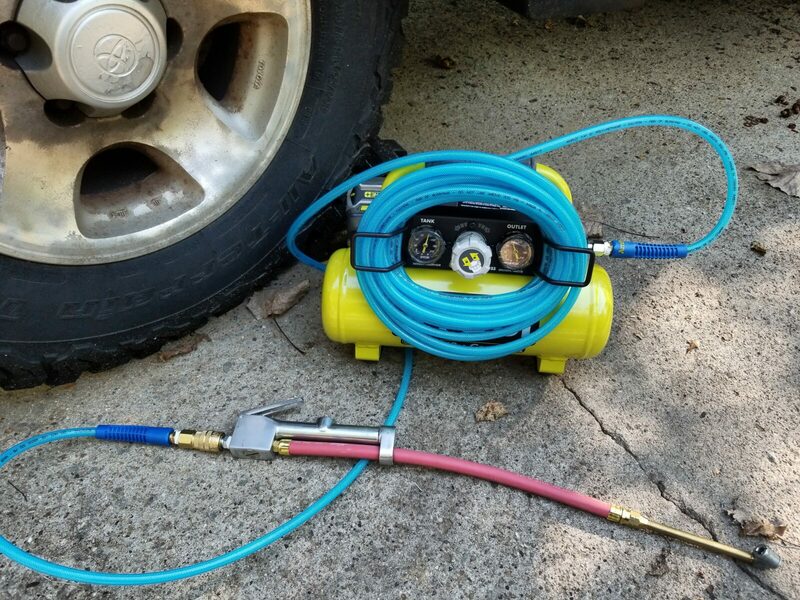 To work on cars, I run 50-100 feet of 3/8″ air hose to where I am working and life is great, For years I had a portable two gallon compressor that required AC that I sold because it weighed quite a bit and needed an electrical cord. Last Spring, I started hearing about various tool companies making cordless air compressors that could be used to run nailers, staplers or even inflate tires. That idea definitely caught my attention. I then read about the Ryobi P739 1 gallon air compressor that uses their common 18 volt batteries. I have a ton of Ryobi tools and batteries so I bought one from www.homedepot.com with home delivery. Note, I specifically bought the model above – there are other previous models but I can’t speak to them. First off, this is not an inflator that puts out tiny amounts of air. This has a 1 gallon tank that is pressurized to 120 PSI and has an adjustable regulator. This little compressor is meant for tools that have low air requirements or inflation as it does not put out a ton of air – 0.75 standard cubic feet per minute (SCFM) at 40 PSI or 0.5 SCFM at 90 PSI. Note, I am just going to write SCFM for the compressor because Ryobi says the above is a SCFM rating. CFM is different and click here if you want a pretty good explanation. Once the tank is pressurized, you’ll have enough air to run a brad nailer, finish nailer or stapler. The question becomes how many nails can you drive before the compressor will need to kick on and refill the tank. The answer unfortunately is “it depends” because of the requirements of the tool. It will never put out enough air for tools that require a lot of air like ratchets, impact hammers, sanders, spray painters, etc. Don’t even consider it for those tools that say they require over 2 CFM. The Ryobi simply was not designed for those use cases and never claimed to be. This little compressor will probably be great for 10-20 finish nails/staples and then need to run its compressor. If you try to use the tool too fast when it is trying to recharge the tank, odds are you will draw more air than the tool can deliver and the pressure will continue to drop. Remember – the compressor itself is small. When the tank pressure drops and the compressor kicks on, it will need time to recover. You’ll notice I didn’t mention a framing nailer or even a roofing nailer. Odds are the compressor can do a few of those but it would never keep up. Portable job site compressors for nailers can deliver 3-5 SCFM @ 90PSI and keep up with even several nailers running. If you plan on some quick fix with just a few nails then sure, this would work. 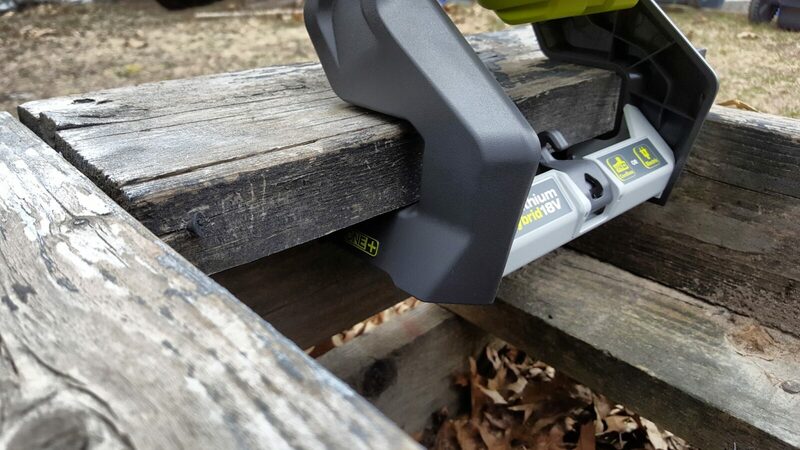 What this little Ryobi brings to the table is portability. It is only about 14 pounds before you add the battery and tools. 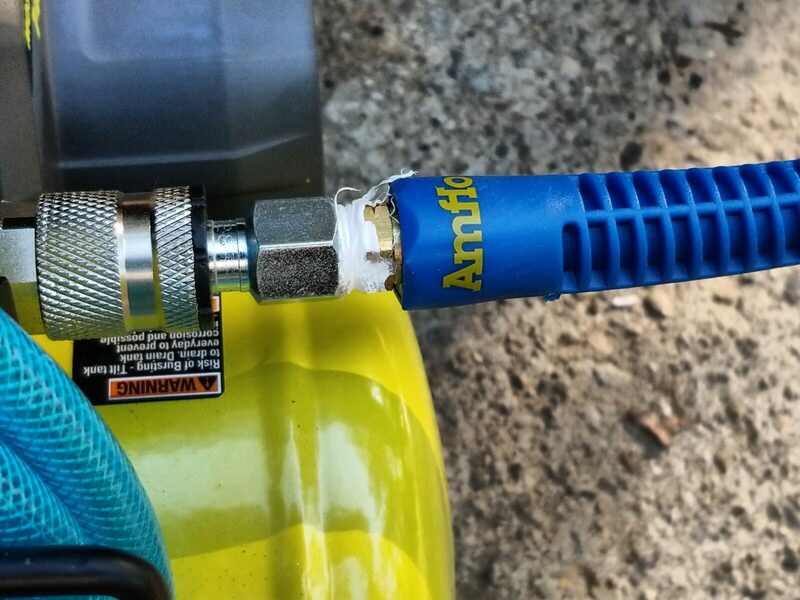 I use one of the big 4 amp hour Lithium Ion batteries on it and then keep a 25 foot Amflo line on it with Milton 1/4″ quick connect fittings. [amazonjs asin=”B000Q759T4″ locale=”US” title=”Amflo 12-25E Blue 300 PSI Polyurethane Air Hose 1/4″ x 25′ With 1/4″ MNPT Swivel Ends And Bend Restrictor Fittings”]. I like the Amflo line as it is made from polyurethane and remains flexible even in cold weather plus it doesn’t leave scuff marks everywhere. The old rubber and PVC air hoses are big, bulky and really get stiff. As mentioned in the past, I just use Milton fittings now. Harbor Freight, Home Depot and other discount brands have let me down one too many times including excessive air leaks with wear and even breaking. One last small tip, use good Teflon tape. The stuff I am using right now is off Amazon and is way thicker than the cheapo stuff you often see. I have a 16ga NuMax finish nailer and an 18ga Wen finish nailer that work just fine with this plus a Surebonder T-50 Stapler. I have others but these are the ones that I have used with the Ryobi and am happy. Again, I am not doing high volumes – more like small projects, repairs, etc. What I use the Ryobi for the most is to top off car and truck tires. It really makes this chore easy. Sure my big compressor is faster but to go around and add up to 5-10 PSI to a tire is easy with this. To give you an idea of size, the next photo shows the unit next to one of my Landcruiser’s good sized 275/70R16 tires. I used to lug around a portable five gallon tank but it weighs a ton, is cumbersome and I might need to refill it several times before I get done. If I didn’t do that, I would have to pull the car around by my shop, hook up a line to reach it and then fill the tire – that can also be a headache unless the line is already hooked up. What you see above is a Milton S-506 tire inflator that I keep on it. I have another in the garage that is beat to death but still working. 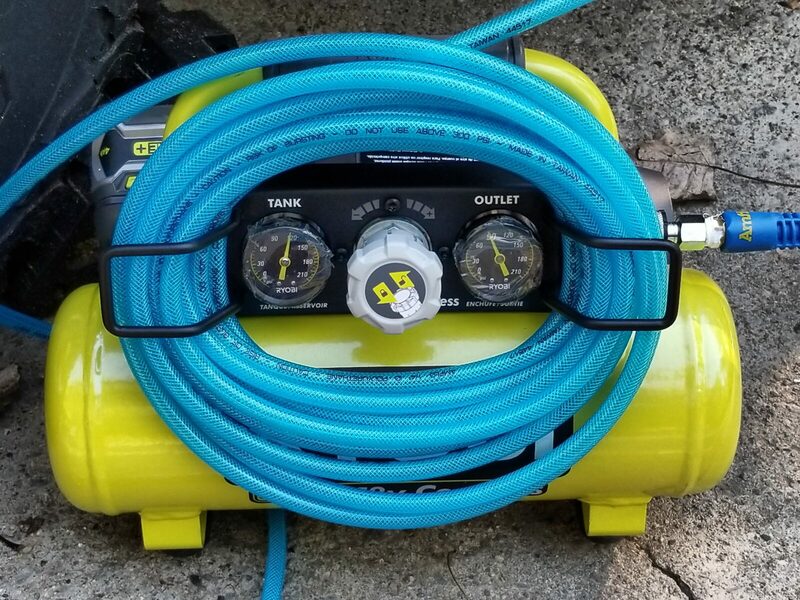 It is so very, very handy to have the inflator and pressure gauge in one unit plus chuck heads at two angles for bikes, tractors, trailers, etc. Part way into the first tire the compressor turned on and continued running as I did all four tires on the car. The battery’s LED charge indicator dropped one bar out of four. The compressor turned off maybe two minutes after I topped off the last tire. In summary, I’ve been using this compressor for over two months mainly for topping off tires and that really puts some stress on the little unit. It seems to be holding up just fine. It gets lugged around my shop, the drive way in the trunks of cars and no problems. I can easily go out and check all our vehicle tires and top them off where they sit . 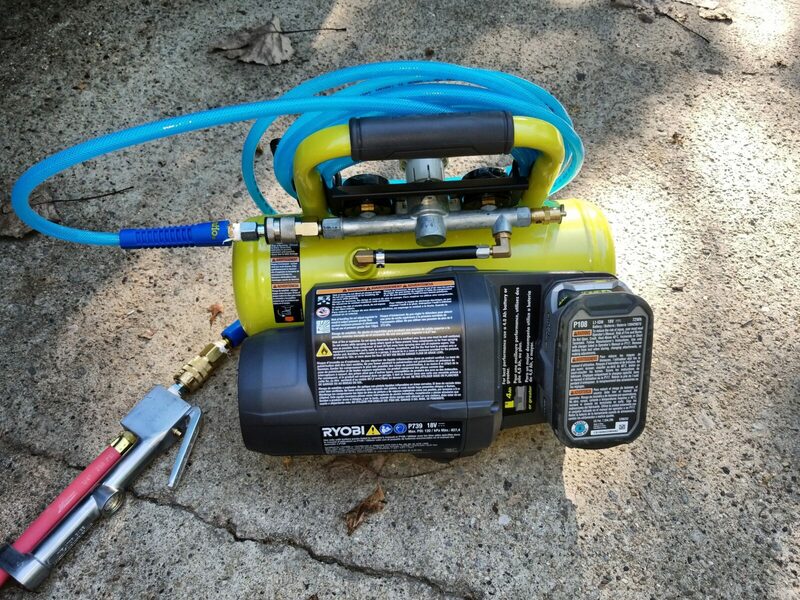 If you use Ryobi 18 volt tools, have the batteries and are in the market for a light duty portable compressor for the uses I outlined above, I’d recommend this one. If you use another brand of 18-20 volt tool, I bet your vendor is making a portable compressor as well that you might want to research. Ryobi P1870 18V ONE+ Lithium-ion Impact Driver Kit w/ Battery and Charger !!!!! RYOBI OP400 / OP401A 40V LITHIUM ION LI-ION BATTERY CHARGER - 60 DAY WARRANTY !! Okay, some guys sneer at the Ryobi power tools but I have gotten my money’s worth from their 18 volt drills. I bought one of their 18 volt sets years ago and have two drills, an impact driver and a hammer drill that I use all the time. One drill has done 3-4 decks and the other at least two. I burned out one hammer drill a year ago and replaced it and the others are going strong. Along with the tools came an 18 volt work light that I have used a ton especially while working on cars. I’ve replace the incandescent bulb probably at least three times over the years. As luck would have it, I dropped the light the other day and busted the bulb. 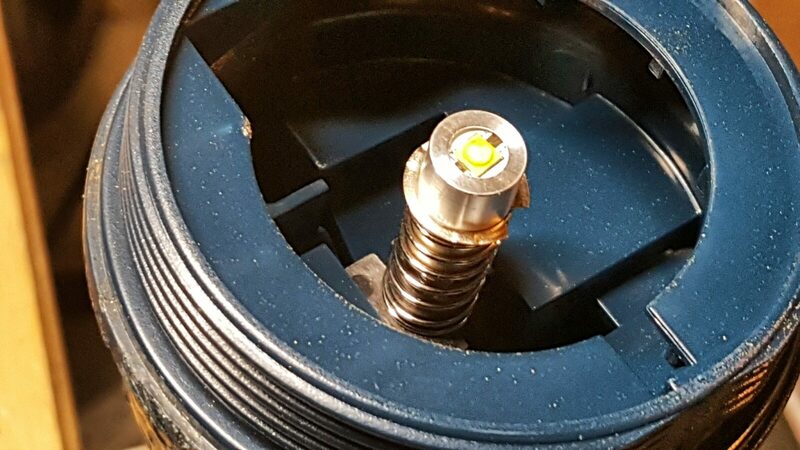 Rather than buy another replacement bulb, I decided to move to an LED unit. 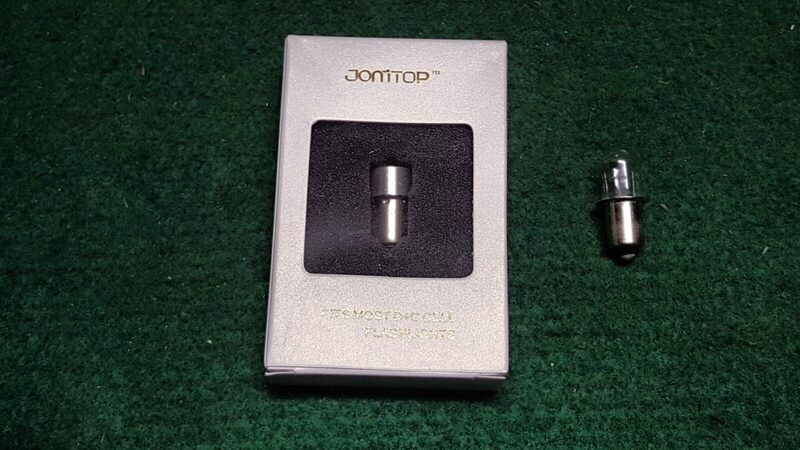 I did some digging and bought a Jomitop P13.5S from Amazon – two of them actually as I have two of the work lights. Now I wish I could say the upgrade went great but the resulting light is a weird crescent shape – even when it is just the LED by itself with no lens or reflector. 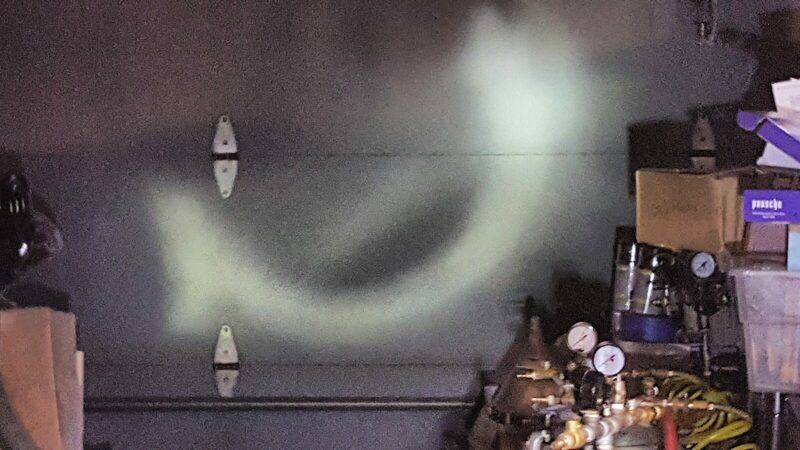 Both LEDs did this. I plan on returning these two units as defective and have ordered two more models from other sellers on Amazon. So, for now, pass on the Jomitop P13.5S model. I’ll post on what works later but wanted to get the honest review out.